Despite a significant reduction in land area since 1975, savannas still dominate the Guinean landscape, accounting for 54 percent of the national land surface. Savanna loss is mainly due to agricultural expansion, with cropland area having doubled over 38 years. Driven by population growth, the mean rate of agricultural expansion rose dramatically from 1.3 percent per year during the 1975–2000 period to 4.7 percent per year between 2000 and 2013. However, agriculture expansion was not equal throughout the country. Southern ecoregions, especially the Zone Forestière (ZF – Forest Zone), the eastern Zone Pré-Forestière (ZPF – pre-forest Zone), and the Fouta Djallon massif have experienced the greatest expansion. In these zones, the practice of slash-and-burn on steep slopes increases their vulnerability to erosion. However, agricultural practices, such as terrace cropping and rock lines have helped to mitigate soil erosion. Farther westward, on the Plateaux de Basse-Guinée (PBG – Lower Guinea Plateaus), in the Zone de Savanes et de Montagnes (ZMS – Savana and Mountain Zone), and in the ecoregion of the Socle Précambrien (SP – Precambrian Shield) where soils are rocky, non-productive, and relatively unsuitable to cultivation, agricultural development is limited to alluvial valleys and low plateaus. Irrigated agriculture has also doubled since 1975, especially in the Plaines Agricoles du Bassin du Niger (PABN – Agricultural Plains of the Niger Basin), which lend themselves to rice cultivation. Between 1975 and 2013, forest areas decreased by about 33 percent to only 4,440 sq km, found mainly in the Zone Forestière (ZF – Forest Zone). One major cause of this reduction is the significant population growth resulting from a heavy migration from the north and from a huge influx of refugees from Sierra Leone, Liberia, and Côte d’Ivoire. Non-protected forest areas have been severely degraded by uncontrolled logging for both local and commercial uses, and by slash-and-burn cultivation. While Guinea’s national forests are receding, there is remarkable stability among Guinea’s forest “islands” (Fairhead and Leach, 1994). Many hundreds of forest islands — areas of high forest around villages— have been encouraged and managed by villagers for centuries. Several ethnic groups in the forest-savanna transition zone maintain these multi-purpose forest islands. 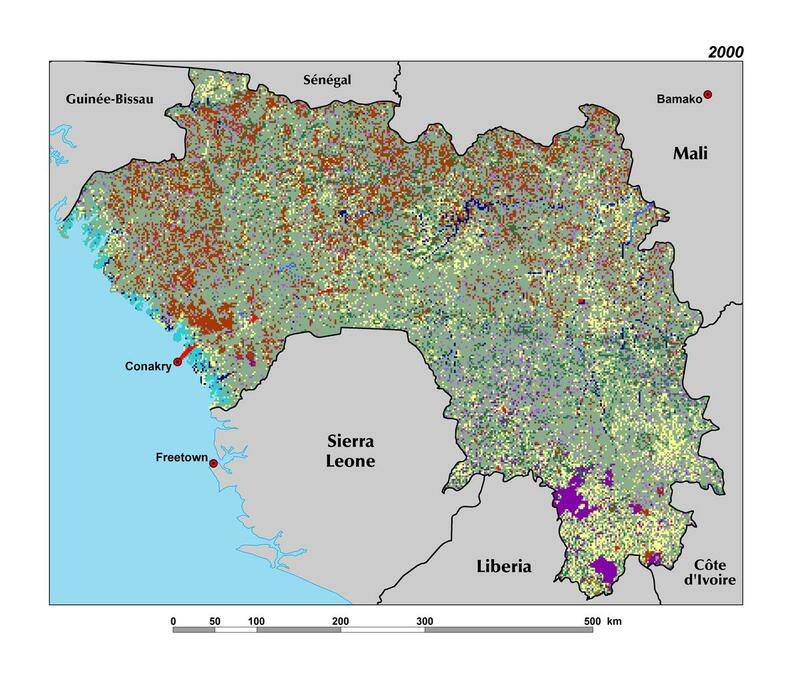 Woodlands and gallery forests, with a land surface three times higher than that of dense forests, have not experienced the same high level of deforestation as Guinea’s dense forests. Woodlands and gallery forests are found in all regions of Guinea and their surface area has only decreased by 0.5 and 2.7 percent, respectively, over the 38 years. Bowé — laterite-capped plateaus that characterize much of Guinea’s landscapes — accounts for 13 percent of Guinea’s land surface. Naturally, bowé are very stable over time. While unsuited to cultivation, these treeless grasslands serve as important water catchment areas and as pasture for livestock. The land area of large industrial mines has tripled between 2000 and 2013, increasing from 40 sq km to 130 sq km. They are testimony to the development of Guinea’s growing industrial mining sector. Although local-scale artisanal mining is difficult to map at a national scale, it has also intensified as the price of gold has risen, and has a significant impact on the environment.